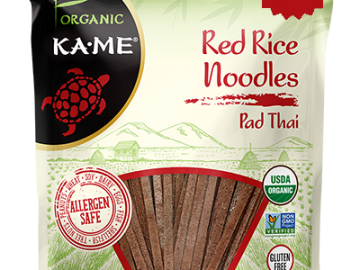 KA•ME Organic Rice Noodles, premium quality, grown and harvested on an organic farm in Thailand and naturally gluten free. It is a traditional ingredient, versatile in many Thai and Southeast Asian recipes and perfect served hot or cold added to stir-fries, soups and salads. 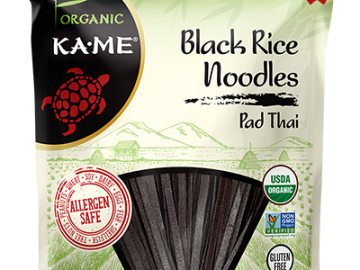 Directions: Soak noodles in 5 quarts of hot water (not boiling) for 10-12 minutes, stir occasionally to keep noodles from sticking. Drain. For Stir-Fries and Cold Salads: Add noodles and oil to skillet and cook for 2-3 minutes. 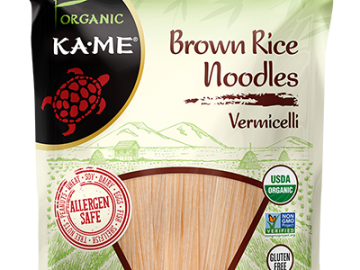 For Hot Soups: Add noodles to finished recipe in serving bowls and let sit for 2-3 minutes or until desired tenderness. Note: Cooking instructions are intended to achieve a firm noodle texture.